The Air University (AU) is a component of the United States Air Force's Air Education and Training Command, headquartered at Maxwell Air Force Base, Alabama. The Air University is the U.S. Air Force's primary center for professional military education. The mission of the Air Force Research Institute is "To conduct independent research, outreach and engagement that contribute ideas for enhancing national security and assuring the continuing effectiveness of the United States Air Force." AFRI supplements the Air University and Air Force idea-generating capacity and supports air and space research inquiries from the Chief of Staff, as well as other top-level decision makers throughout DoD, and Defense Industry. The Air Force Research Institute enhances continuing studies, supports student research and conducts specialized research projects for the Air Staff and DoD to enhance national security and to provide relevant research for the United States Air Force. AFRI also partners with Allied International Military Air Chiefs on research projects. Just as airpower revolutionized modern warfare, so is the Air Force Research Institute (AFRI) charged with revolutionizing our service through conducting independent research, outreach, and engagement to enhance national security and assure the effectiveness of the United States Air Force. Through the three pillars of research, outreach, and engagement, we seek to improve the combat capability of our service by engaging in intellectual discourse, and welcome opportunities for interaction and dialogue with individuals and organizations on subjects relating to the national security. The Thomas N. Barnes Center for Enlisted Education (formerly the College for Enlisted Professional Military Education) is responsible for the instructional programs and faculty development for all Air Force enlisted professional military education programs. This includes the Airman Leadership Schools, Noncommissioned Officer Academies and the Air Force Senior Noncommissioned Officer Academy. The Air Force Senior Noncommissioned Officer Academy graduates more than 1,800 Air Force chief master sergeant selectees, senior master sergeants, senior master sergeant selectees, and non-commissioned officers from other U.S. military services and the services of international U.S.-allied nations annually. It is located on Maxwell AFB's Gunter Annex. The NCO Academies provide selected noncommissioned officers quality professional military education to develop their skills and responsibilities in the United States Air Force. The objective is for the student to gain an understanding of their positions in the military structure and the need to develop the skills necessary for effectiveness in those supervisory positions. Several NCO Academies operate worldwide on various Air Force installations. Airman Leadership School's mission is to prepare Air Force personnel in the rank of senior airmen for supervisory duties and foster a commitment to the profession of arms. The goal of the program is to provide senior airmen an opportunity to understand more fully their position in the USAF organizational structure and the continued need for professional development to be effective NCOs. The Spaatz Center for Officer Education unifies the continuum of Air Force officer professional military education. Activated 29 Apr 2008, the Spaatz Center is named in honor of the Air Force's first Chief of Staff, General Carl A. Spaatz. The Spaatz Center remains committed to being the global leader in officer education by developing leaders, spurring innovation, and nurturing partnerships to advance airpower. Squadron Officer College Develops company grade officers as leaders of integrity, ready, willing and able to overcome the challenges of today’s complex security environment. The eight-week Squadron Officer School (SOS) provides a professional military education experience devoted to junior officer leadership development. Open to active duty, Air National Guard and Air Force Reserve Captains, their international counterparts, and civilian equivalents. Air Command and Staff College A master’s program that prepares field grade officers, their international counterparts and U.S. civilian equivalents for positions of higher responsibility with the military and other government agencies. Air War College A 10-month resident course for Lieutenant Colonels, Colonels, and civilian equivalents, prepares students to lead in a joint, interagency and multi-national environment at the strategic level of military operations. International Officer School A seven-week course provides international officers an enhanced understanding of the United States and prepares them for attending Squadron Officer School, Air Command and Staff College, and Air War College. The Air Force Officer Accession and Training Schools (AFOATS) operates two of the four officer commissioning sources. These are the Air Force Reserve Officer Training Corps (AFROTC) and the Air Force Officer Training School. Although they are USAF officer accession and training programs, the United States Air Force Academy and the Air National Guard's Academy of Military Science (AMS) do not fall under Air University. The Air Force Academy is a Direct Reporting Unit (DRU), and the Superintendent of the Academy reports directly to the Air Force Chief of Staff. Admission to and administration of the ANG Academy of Military Science is controlled by the National Guard Bureau. The Air University administers the Air Force Junior Reserve Officer Training Corps (AFJROTC) program. This program provides citizenship training and air and space science education via a cadet program for high school students. The Air University is the command echelon equivalent to a numbered air force for the Civil Air Patrol (CAP), the official United States Air Force Auxiliary. CAP supports the nation through three missions: emergency services, aerospace education, and cadet programs for middle school/junior high school and high school students. The Community College of the Air Force (CCAF) is the only degree-granting institution of higher learning in the world dedicated exclusively to enlisted personnel. CCAF offers educational opportunities for active duty, Air National Guard and Air Force Reserve airmen and NCOs to earn a job-related, two-year undergraduate associate of applied science degree. CCAF also facilitates selected professional certification and recognition for airmen. Possession of a CCAF degree has in recent years become a de facto mandatory requirement for promotion to Senior Master Sergeant and higher, regardless of whether or not the candidate has a civilian degree such as a baccalaureate. This de facto status is now official: starting with the 2007 promotion cycle, promotion candidates cannot receive critical endorsements on performance reports without having first received an Associate degree from CCAF. The Air Force Institute of Technology (AFIT) supports the Air Force and national defense through responsive degree-granting graduate and professional continuing education, research and consulting services to Air Force and Department of Defense agencies. Graduate-level work offers selected Air Force members, Air Force civilians, and international officers the broad educational experience necessary for understanding the role of technology in national defense and in analyzing and solving defense-related problems. The Air Force Doctrine Development and Education Center develops and publishes Air Force doctrine, teaches doctrine through resident and on-line courses, and advocates airpower through visionary wargaming. The International Officer School conducts classes to enhance international officers' understanding of the United States and to prepare them to attend Air War College, Air Command and Staff College or Squadron Officer College. The School of Advanced Air and Space Studies (SAASS) is the US Air Force graduate school for airpower, space power and cyber power strategists. A highly qualified and motivated faculty, a small and very carefully selected student body, a coherent and challenging curriculum, an outstanding educational and research resources, and a well-designed facility combine to produce tomorrow's senior military leaders who are experts in the employment of air, space and cyberspace forces. SAASS is a follow-on school for selected graduates of intermediate-level professional military education schools. The focus of SAASS is to educate officers in the art and science of air, space and cyberspace warfare to enhance the Air Force's capacity to defend the United States through the control and exploitation of air and space. During 1943–1945 the Army Air Force School of Applied Tactics operated a combat simulation facility in Florida. Units and airfields were established throughout an 8,000-square-mile (21,000 km2) area of north central Florida designated a mock "war theater" stretching roughly from Tampa to Titusville to Starke to Apalachicola in which war games were conducted. Air University (AU), established in 1946, continues the proud tradition of educating tomorrow's planners and leaders, in air and space power for the Air Force, other branches of the U.S. Armed Forces, federal government civilians and many international organizations. Today, AU has a reach worldwide affecting the careers of every Air Force member. Because of the wartime need for officers of the caliber of those attending the Maxwell institution, in May 1941 the Army Air Corps suspended instruction at the tactical school and reduced its faculty and staff to seven officers. Anticipating the institution's eventual reopening, the Army Air Corps moved the skeletonized Air Corps Tactical School to Washington, D.C., and placed it under the Directorate of Individual Training. In spite of the institution's successful efforts in developing Air Corps planners and leaders, the Air Corps discontinued the Air Corps Tactical School on 9 October 1942 with the intention of reopening it after the war. To partially fill the educational void left by the discontinuance of the Tactical School and to correct the growing shortage of experienced Air Corps officers, the Air Corps authorized the establishment of the Army Air Forces School of Applied Tactics on 9 Oct 42. The Army Air Forces activated the AAF School of Applied Tactics at Orlando Army Air Base, Florida, with the mission to train "selected officers" under simulated combat conditions. Based on lessons learned in the combat theaters and the school's actual operational experiences, the AAF established the AAF Tactical Center with the AAF School of Applied Tactics as a subordinate unit. Due to a major reorganization of the Tactical Center and a change in the types of courses conducted by the institution, the Army Air Forces redesignated the AAF School of Applied Tactics as the AAF School on 1 Jun 45. In preparation for its post-war educational operations, the Army, Air Forces transferred the AAF School from Orlando to Maxwell Field, Alabama on 29 November 1945 and assigned it directly to the AAF as a major command. Air University became operational on 1 April 1946 when the AAF transferred the School of Aviation Medicine at Randolph Field, Texas, from Air Training Command to Air University. To take advantage of existing facilities, Air University transferred the Air Tactical School from Maxwell Field to Tyndall Field, Florida on 21 May 1946. Major General Orvil A. Anderson was appointed the first commandant of the Air War College, the senior school in the three-tiered AAF officer professional military education (PME) system. Assuming responsibilities comparable to those of the Army and Navy advisers on the HQ AU staff, the Royal Air Force liaison officer became a part of the HQ AU staff on 1 June 1946. Members of the Air University Board of Visitors concluded their first meeting. With such dignitaries as Gen Carl Spaatz, Commanding General of the Army Air Forces; Air Marshall Hugh P. Lloyd, Royal Air Force; and the class members of the Air War College and the Air Command and Staff School participating, Air University was officially dedicated during a ceremony at Maxwell Field. 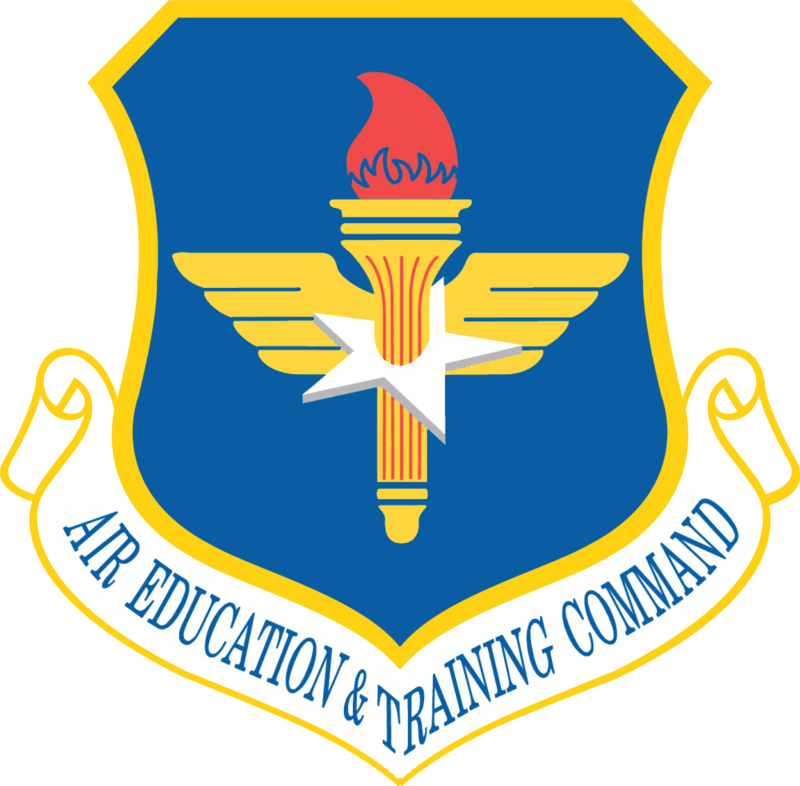 Classes began at the Air War College and the Air Command and Staff School on 4 September 1946, fulfilling the "dream for education in airpower" of most post-war AAF leaders and planners. The Air Tactical School, the Junior officer PME program of the AU educational system, began classes at Tyndall in January 1947 [At some point, ATS returned to Maxwell AFB and became Squadron Officer School (need citations)]. Later that year, the Royal Canadian Air Force sent its first group of students to the two-week indoctrination course at Maxwell. With Secretary of War Robert P. Patterson as the guest speaker, the Air War College and the Air Command and Staff School conducted a combined graduation ceremony. for 185 senior and field grade officers. As a result of the National Security Act of 1947, the United States Air Force became a separate and independent branch of the US military on 18 September. In keeping with the Air Force's new status, HQ USAF redesignated Maxwell Field as Maxwell Air Force Base on 13 January 1948. On 12 July 1949, HQ USAF established the Air University Human Resources Research Institute. It was one of three USAF field agencies created to conduct research on the human factor in Air Force planning and operations. Air University established the 3894th AU School Squadron to provide administrative support to Air Force instructors and students at the various service schools operated by the Army, Navy, and Marine Corps. With a mission to "preserve for those who come after us an accurate and objective account of our present experience", the USAF Historical Division relocated from Washington, D.C., in September 1949 to Maxwell and became a part of the Air University Library.